This is a great winter stew. Very rich and satisfying too. 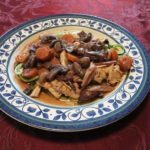 Browning the bacon, chicken and vegetables briefly before adding them to the crock pot creates deep rich flavors in both the chicken and sauce. We served it over zucchini noodles, you could also have it with crusty bread, potato’s, or cauliflower rice or mashed cauliflower. In a bowl, mix together wine, cognac, tomato paste and dried herbs and set aside. Heat a large nonstick skillet over medium heat. Add bacon and cook until golden and just crisp, 3 minutes. Drain bacon on paper towels and set aside. Add chicken to bacon drippings and cook until lightly browned all over, about 3 minutes per side. Transfer chicken to a large plate as done and set aside. Then in the same pan, add all the vegetables and cook until they just begin to soften. Transfer vegetables to crock pot. Arrange chicken on top. Sprinkle bacon over chicken. Pour wine/ herb mixture over the tops. . Cover and cook on low for 8 hours. Season with salt and pepper, then serve.